Framed by the Alps and set upon a riverbank, the city of Fussen in addition to its historic architecture is the epicenter of Germany’s traditional violin-making industry. 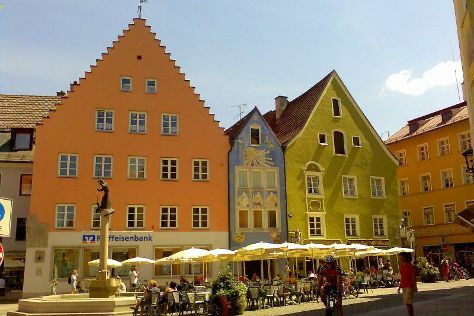 Change things up with these side-trips from Fussen: Zugspitze (in Garmisch-Partenkirchen), LEGOLAND Deutschland (in Gunzburg), Linderhof Palace (in Linderhof) and Dachau Concentration Camp (in Dachau). Next up on the itinerary: admire the striking features of Neuschwanstein Castle, take in the spiritual surroundings of Basilika St. Mang, pause for some serene contemplation at Wies Church, and take in the views from Queen Mary's Bridge (Marienbrucke). To see maps, where to stay, traveler tips, and other tourist information, use the Fussen trip itinerary maker. Use the Route module to find suitable travel options from Kansas City, USA to Fussen. The time zone difference when traveling from Kansas City to Fussen is 7 hours. Traveling from Kansas City in September, expect Fussen to be a bit cooler, temps between 63°F and 46°F. Finish your sightseeing early on the 24th (Sat) to allow enough time to travel back home.